In Jazzpospolita’s music there is a clash between rock and jazz, power and lyricism. The band's melodic, clear songs were complemented by their energy at concerts even at the start of their career. Improvisation and, with time, more and more melancholy, burst into the orderly structures of their music. Jazzpospolita was created in 2008 in Warsaw by bass player Stefan Nowakowski and drummer Wojtek Oleksiak. The initial line-up included guitarist Bartek Borowiec and saxophonist Daniel Grzeszykowski, but they were replaced by guitarist Michał Przerwa-Tetmajer and keyboardist Michał Załęski before the band’s first EP, Polished Jazz (2009), was recorded. The line-up has remained unchanged until today, and the band decided to rely on authorial compositions, frequently closer to post-rock than jazz. Jazzpospolita has never shunned electronics, guitar effects, and on the other hand, dynamic, regular rhythms. It eagerly invokes emotions and creates moods. Thanks to their versatility, the band has gained many fans outside jazz circles. The musicians have produced all their studio albums themselves. Marcin Cichy, half of the duet Skalpel who also records solo as Meeting By Chance, is responsible for mastering Jazzpospolita’s debut album – Almost Splendid (2010). At that time, critics had already noticed how smoothly rock, post-rock, and electronic music merge in Jazzpospolita’s work. In achieving the mood we wanted, our so-called ‘Karwica sessions’ were hugely helpful. Some of the tracks were recorded during our trips to an allotment in Mazury. We immersed ourselves in relaxing and we let time flow peacefully. We would paddle around on a boat, lie in the greenery, and occasionally play something low-key. Less metronome, more time looking at each other. (…) most likely it will appeal to alternative rocks fans more than to lovers of traditional jazz – like the records by foreign bands like Jaga Jazzist or Tortoise, which are also experiments on the verge of jazz, rock, and electronic music. But this Jazzpospolita album is definitely worth attention – the band’s instrumentalists are very mature musically, and make a great team. Jazzpospolita chooses record producers for electronic music very wisely. The record RePolished Jazz, released at the end of 2012, is comprised of two EPs: six intriguing remixes, and the EP Polished Jazz, initially self-published at the beginning of their career. This album is an excellent introduction to the world of Jazzpospolita: in the debut, one can clearly hear their enthusiasm and energy, and although the remixes don’t diverge too much from the (extensive) style of the band, they’re almost like new authorial material. 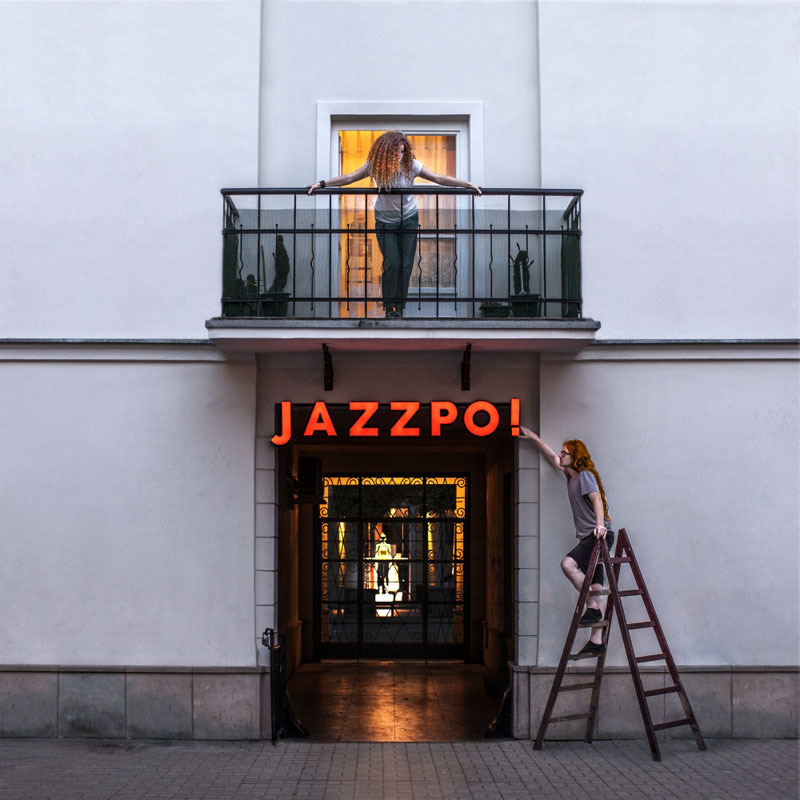 In the autumn of 2014, the album titled Jazzpo! (as fans frequently call the band) was released, surprising the audience with a number of melancholic, impressionist songs, the longest ones (Topniejący śnieg, Lot) lasting over eight minutes. The rock track Motor motor motor, with its spectacular drum passage, was chosen to promote the album. On this album, Przerwa-Tetmajer became the main figure of the band, which had previously played very collectively. Przerwa-Tetmajer’s guitar calls up the music of the Balkans or the Middle East, progressive rock, and elegant jazz. It is the guitar that leads the band through dense rock rhythms and tender ballads. The guitarist released a solo record, Doktor filozofii in 2014, and in the spring of 2016 his band Niskie Ciśnienie (with Alicja Peszkowska as vocalist and Aleksandra Janus as lyricist) debuted. Jazzpospolita has appeared at many festivals, including London Jazz Festival, Match & Fuse, Copenhagen Jazz Festival, Comblain Jazz Festival, Edinburgh Jazz & Blues Festival, Eldenaer Jazz Evenings, Garana Jazz, and Kalingrad City Jazz. They performed at the biggest Polish rock festival, Open’er, and Program 3 Polskiego Radia, one of the most popular radio channels, dubbed Jazzpospolita the live discovery of 2011. In 2015, Jazzpospolita and another band, Pink Freud, went on a tour of China, where they played 11 concerts.